Hutchinson Trinity boys’ basketball coach Joe Hammersmith was effusive in his praise of his Celtic squad in the minutes after the Class 2A state championship game in March at Fort Hays State University’s Gross Memorial Coliseum. Trinity heavily focused on Ness City star John Pfannenstiel and limited him to his lowest point total of the year. However, the Eagles’ supporting cast had a mammoth effort in a 67-55 Trinity loss. Hammersmith’s squad included five close-knit seniors: Kaleb Hammeke, Alex Hammersmith, Joshua Bridgewater, Jack Neal and Zane Schroeder. All but Bridgewater had been together since kindergarten. “I have been very, very fortunate to coach some great kids, and being my 25th year and the end of the road for me, I couldn’t have asked for a better group of young men, because there is nothing fake about them,” Hammersmith said. Additionally, Kaleb’s younger brother, Lucas, was a standout player for the 22-4 Celtics. Trinity advanced to its fourth final four in school history and made the finals for the first time since ’98. The Celtics have one title, in ’87. Kaleb, the team’s high-flying point guard and career 1,000-point scorer, has signed to play basketball at Fort Hays. He was known for his dunks all winter. Hammeke was a standout quarterback for several seasons for the Celtics. He led Trinity to a 9-2 mark last fall before the big basketball season. 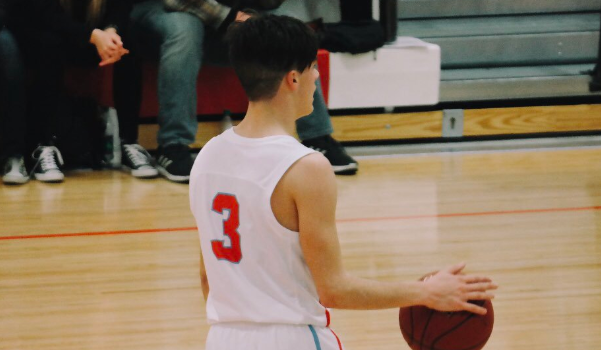 Kaleb was one of five players named 2A first team all-state by the Kansas Basketball Coaches Association in late March. He was also a 2A Sports in Kansas All-State selection, a Top 30 player in Kansas and a 2A Player of the Year finalist by Sports in Kansas, an award that went to Pfannenstiel. Hammeke was a highlight reel in 2018-2019 and one of the best players in the state, regardless of classification. Kaleb greatly enjoyed playing at Gross Coliseum, which annually has among the nation’s biggest crowds for Division II men’s and women’s basketball. Normally, Class 1A is held at GMC, but 2A was switched there this year. The Hammekes had a large cheering section, including their uncle, Fort Hays athletic director Curtis Hammeke. “Got a lot of support, it’s a dream come true really,” Kaleb said. The second-seeded Celtics opened with a 49-23 victory against Mission Valley and then held off Pittsburg-St. Mary’s-Colgan, 36-31, in a grinding game that had under 45 possessions. In the win against Mission Valley, Hammeke led his team with 16 points and tied for the team-high with five rebounds. He shot 7 of 14 from the field. In the Colgan win, Kaleb tallied six points, including two huge 3s. Lucas led with 10 points. “They have got good perimeter shooting with the two Hammekes,” Colgan coach Wayne Cichon said. In the final, Kaleb had 13 points and a team-high seven rebounds, while Lucas paced the Celtics with 17 points.